Good morning and welcome to our last FX Report in this week and month. We hope you will have a successful last trading day and a nice weekend. On a long-term view, the USD fell towards its fourth monthly drop against the EUR, which is the longest stretch since 2004. The US’s economic situation renewed optimism that a global recovery will quicken, which increased demand for higher-yielding currencies. The JPY has also reached a record monthly loss against the EUR as it fell to its biggest one since May. The falls in the JPY may be caused by the government report that showed that the nation’s jobless rate unexpectedly dropped for a second month. This reduced demand for the JPY as a save haven. Today, the EUR/USD climbed for a second time as it reached a high at 1.4858. The most traded currency pair reached a high at 1.5063 this month, which was the highest price since the 11th of August 2008. Anyway, investors remained skeptical that the Fed will increase interest rates early next year. Yesterday, Fed funds futures indicated a 33 percent chance that the central bank will lift interest rates. Yesterday climbed the strong AUD after global stocks and commodity prices gained. Commodities comprise more than a half of the south pacific nation’s exports. Yesterday, the AUD/USD climbed over 180 pips. 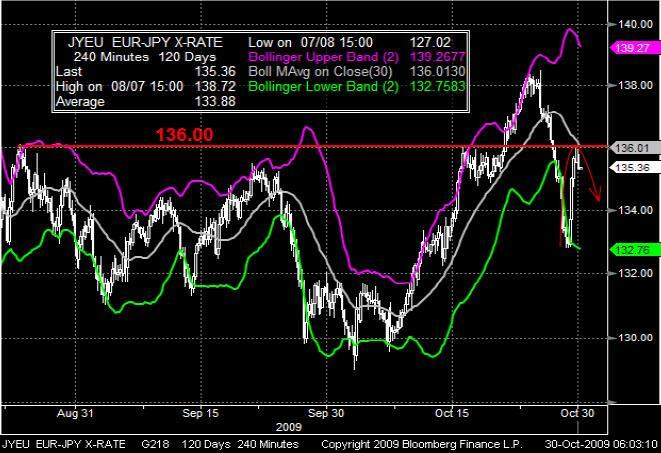 After breaking through the 136.00 support level during October, the EUR/JPY reached a low at around 132.80 and pulled back to the 136.00 level, which is a technical and a psychological resistance now. It additionally reached the middle Bollinger band, which could indicate that the market is ready to pull back down. If the pair doesn’t break the 136.00 resistance line, it may pull down towards the lower Bollinger band. As you can see the EUR/GBP pulled already up last week as it reached the first support level of the pivot points which established exactly on 0.9000. 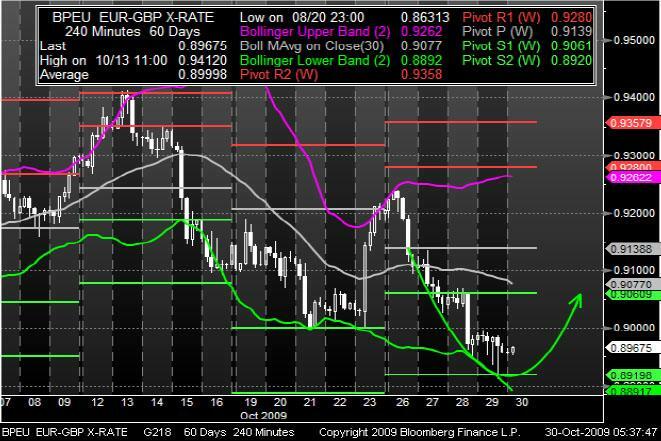 This week the market already reached the second support of the pivot points, which stays on 0.8920. In addition, the market has already been touched by the lower Bollinger band. This analysis could be a sign for a rebound.